Potatoes in Practice is the biggest field potato event in the UK and brings together variety trials, research, seminars and trade exhibits in one place making it an unmissable date in the potato industry calendar. It is sponsored by Potato Council and features trials and demonstrations from The James Hutton Institute, Potato Council, SAC, Agrii (formerly Masstock Arable (UK) Ltd.) and the potato industry. Potatoes in Practice runs from 9.30am to 4.30pm. Marquee and machinery exhibits can be visited at any time. Tours will run at 10am, 11.30am and 1.30pm. Seminars will be given twice throughout the day. The full event guide, timetable and list of exhibitors are below. 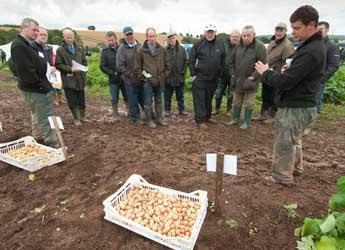 Attendance at Potatoes in Practice is free and there is no need to book in advance. However you can fill out the registration form below and bring it with to speed up your arrival. Information for exhibitors can be downloaded below in either Word or PDF format. If you have any queries please contact Sharon Neilson (Tel: 01382 568750).